One issue that often arises at Linguistic Institutes is what is the best way of assessing students, given that the Institute is short and intensive while the class and event schedule is relentless and extensive. On this page we have compiled an informal set of guidelines, based in part on advice from past Institute instructors and students. We also include some information on resources available for instructors to help manage their courses. We would be happy to receive further feedback to pass on to future Institutes. Please take into account that, except where noted otherwise, these are only guidelines, and we leave it up to you to decide how to best design your class. Information regarding housing, arrival, parking, and most other general inquirires for instructors can be found in our Instructor's Guide. This is a work in progress, so be sure to check the link periodicially for updates. We will not have printers and encourage paper-free coursework. Should you need print materials see below. Enrolled participants may take regular session courses for a letter grade or P/F. Students will be given a grade (A, B, C, D, F(ail)) or P/F at the end of the course for the work they have done. Your Canvas shell has been divided into sections: "Pass/Fail Students" and "Graded Students." You will put your students into the appropriate section, based upon their grading preference (determine this on the first day of class, or in a Canvas questionnaire). Students will NOT be able to receive a grade of Incomplete for Institute courses. We leave it to the discretion of each instructor to decide how to deal with a student who fails to turn in some required work; in some instances, this may result in the assignment of a grade of F.
You will change the role of an auditing student to "Observer" in the People section of your Canvas shell. It is up to the individual instructors to permit auditors to attend class. If you get requests for auditing, please take into account that space in classrooms is limited, and that preference will be given to registered students. When classes start, if you see that there is not enough room for auditors, you can feel free to not grant requests for auditing. If the class has a waiting list, priority will be given to people on the waiting list to audit before allowing other auditors into the class. The Institute has a long history of allowing auditors to attend courses, but we must stress that these participants, while not registered for the particular classes they are auditing, MUST be registered for the Institute. Nobody will be allowed to audit classes without registering for the Institute (after which they may audit classes beyond those that they are registered for, subject to permission of the instructor). Of course, instructors can audit other instructors' classes. Canvas is where you have access to your class roster, communicate with your students, and manage your course. 3 THINGS MUST HAPPEN for you to have access to your course shell. 1. Complete your Institute REGISTRATION and select up to four courses you intend to audit. 3. 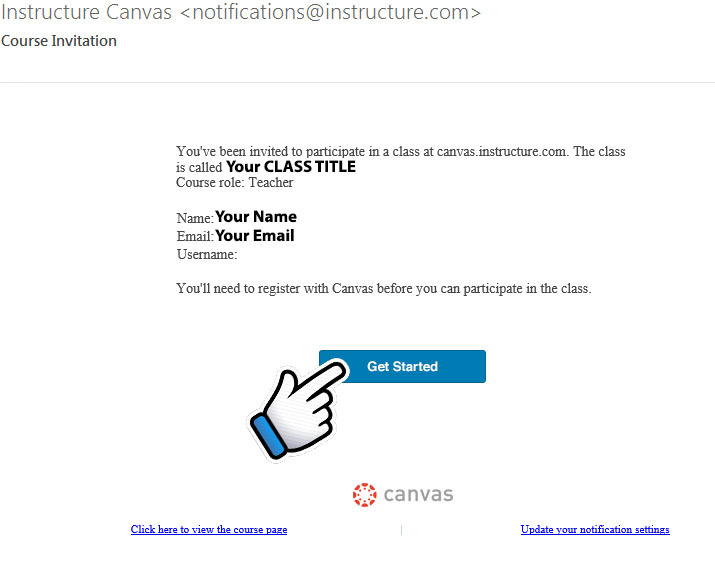 Be on the lookout for an invitation email from Canvas and click "Get Started". Want to learn more about Canvas? Each Institute could should be treated as a 1 credit-hour graduate level course. Remember that enrolled participants will be registered for four classes; that is, they'll be spending 4 hours a day in the classroom on average, and more if they audit additional classes, as most participants do. Furthermore, there are Institute lectures, workshops, and other special events both on weekdays and weekends, and participants need some time to socialize with each other. Thus, they will not have a great deal of time left to do readings and assignments during the Institute, and weekends are unlikely to be available for major "catch up". We ask you to plan course requirements accordingly, providing assignments and/or projects that are most central to your class content. Much of the value of the Institute is in attending classes. We think that it is fully reasonable to take attendance at every class meeting and to make regular attendance (say, attendance at 5 or 6 out of the 8 class meetings in a 4-week course) an important component of a passing grade. You may use Canvas to keep track of class attendance or record it using your own method. In designing assignments, projects, or tests, please keep in mind that enrolled participants must submit all work before the end of the Institute as we will not allow students to receive the grade of Incomplete; furthermore, you will be expected to turn in grades shortly after the Institute is over. Do give short, well-defined questions that allow students to show that they have grasped key concepts. The questions could involve extending an analysis to a new set of data (perhaps the analogous data in another language that a student is familiar with), constructing a set of data that would help verify a hypothesis, or summarizing/critiquing a core reading. A question can be well-delineated and still require students to show imagination and creativity in their answers. In introductory and hands-on courses, regular, short assignments may be the best option as they ensure that the students learn the material. In other courses, it is reasonable to ask for one assignment due at the end of the course or for two shorter assignments, one due in the middle of the Institute and one at the end. If you go this route, make choices that will help students not feel overwhelmed during the last week of the Institute. In the past, some hands-on or lab courses have used group work, where students are encouraged to work on a manageable project throughout the Institute. For instance, groups of 3-4 students can be given a data set at the beginning of the Institute that they analyze using the various tools they learn as the Institute proceeds, cumulatively writing a brief report on what they found. This model allows students to accomplish something substantive, while working with peers from other schools and making lasting connections. Think carefully before asking students to write a final original research paper, even a short one, as students won't have the time to choose topics, do the background research, and write the paper. A feasible alternative might be a short (say, 500-1000 word) squib that shows a student's ability to define a problem for future research in the context of class material. Some instructors have found it useful to ask students to submit a thoughtful question on the assigned reading before each class; these questions allows an instructor to get a sense of how deeply each student is reading and to make sure the class covers the issues that most concern the students. These questions have then formed a major component of student assessment. Students should turn in all assignments by August 3, 2017 to allow time for grading. Exception: the 4 Institute staff members may have until August 7, 2017 to submit their work. Most students will postpone all but the most essential course reading until after the Institute, so please choose your essential reading assignments carefully and announce these clearly. Assigning about one substantive journal article or book chapter per class would be reasonable. If you plan on using a textbook for your class, please place this information into your Canvas course shell, so that students may make the proper arrangements to get your text. We strongly encourage you to publish electronic copies of any required texts, as some students will not be able to afford/obtain texts before the Institute begins. Do schedule a couple of hours of office hours each week; many students want a chance to talk to you about their work. Remind students not to wait til the last week to come talk to you as your schedule may get overly full then, and you might have to disappoint them. We also encourage you to take questions by e-mail during the course; please make your policy on this clear. We recommend you plan to meet your students at the LStarbucks at the William T. Young Library. We strongly encourage you to make materials (e.g. readings) available online for students. We have provided each of you with a Canvas course shell so that you may upload materials and communicate with your class. 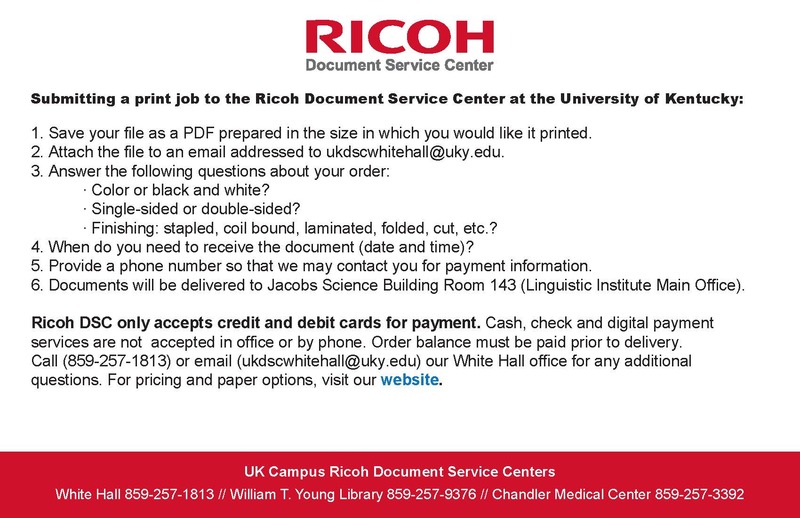 We very strongly encourage our faculty to go paperless during the Institute using one of the online methods listed above. The Institute will not be able to provide access to printing and copying resources. All classrooms will have standard AV equipment (including a projector). If you plan on using slides, please make sure that you have the proper VGA adaptor for your laptop. We'll have a number of student volunteers that will help instructors setting things up, if needed.